Director/Story – Anubhav Sinha, Screenplay – David Benullo, Khanika Dillon, Mushtaq Sheikh & Anubhav Sinha, Dialogue – Khanika Dhillon & Niranjan Jyengar, Producer – Gauri Khan, Photography – Nicola Percorini, Additional Photography – V. Manikandan, Songs/Background Score – Vishal and Shekhar, Lyrics – Vishal Dadlani, Anvita Dutt, Panchhi Jalonvi & Kumaar, Visual Effects Supervisors – Maresh Hingorani & Jeffrey Kleiser, Visual Effects – Red Chillies VFX, Additional Visual Effects – Alien Sense Pvt. Ltd., Crest Animation Studios, DC Studios, D-Cube Studios, Eyesquare Studios, Intelligent Creatures, Jupiter Animation Studios Pvt. Ltd., Labyrinth Cinematic Solutions Pvt. Ltd., Mattes and Miniatures UK, Plowman Craven UK, Powderkeg, Prime Focus, Synthespian Studios Incorporated, Tata Elxi, Timeslice UK, Vaishav Studios, Vensat Tech Services Pvt. Ltd., Visual Computing Lab, Ra. One Suits Designed by Robert Kurtzman, Production Design – Sabu Cyril & Marcus Wookey. Production Company – Eros International/Red Chillies Entertainment/Winford. Shekhar Subramaniam is an Indian videogame designer living in London with his wife Sonia and son Prateek. Prateek suggests that villains are always more interesting than heroes. This inspires Shekhar to come up with a videogame where players must fight a near-undefeatable super-villain. One of the design team suggests the name Ra. One for the villain, a homonym for the ten-headed Hindu demon Raavan, after the program name Random Access Version One. The hero of the game is named G. One and Shekhar’s own face is used as a digital model. During the trials, Prateek enters the game and goes up against Ra. One using his log-in name of Lucifer. Ra. One then comes to life and emerges out of the videogame environment into the real world. He comes hunting Prateek, looking for Lucifer to finish the fight they started. Shekhar is killed as he tries to stop Ra. One. However, G. One has also emerged out of the game and comes to the aid of Sonia and Prateek, defeating Ra. One. G. One flees with them as they head back to Mumbai for safety. There G. One proves awkward in trying to deal with the real world. Sonia also becomes attracted to him because of his resemblance to Shekhar. However, Ra. One, who is able to shapeshift into different human likenesses, returns to life and comes pursuing them. 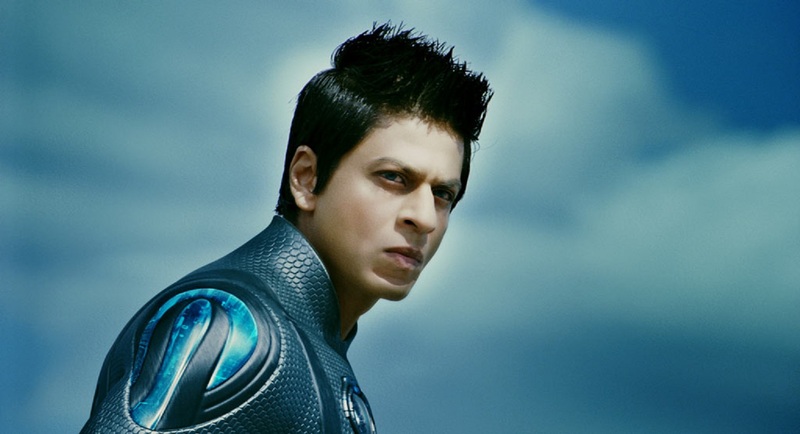 In the early 2010s, Bollywood cinema has started to discover the science-fiction film. Bollywood (or Indian) cinema has always existed on a steady diet of populist films that mix a colourful blend of romance and musical. In the past, Bollywood has co-opted various other genres such as the crime film and occasional thriller. That said, the types of films that are usually reviewed on this site never seem to turn up much in Indian cinema. Despite the paucity of science-fiction to be found in Bollywood cinema, the 2010s held a sudden opening of doors first with Action Replayy (2010), Enthiran the Robot (2010) and then Ra. One here, followed by Joker (2012) and PK (2014). Ra. One also includes a cameo from Superstar Rajini, the hero of Enthiran, dressed as his android hero Chitti, standing up to proudly be proclaimed “our superhero.” There is a common theme in both Enthiran and Ra. One of mechanical men as superheroes and protectors of women. The two films take place in simplistic black-and-whites where it seen that heroism always has an equal black-hatted villainy opposing it, while the films also contain comedy B plots about the unworldwise mechanical men having to fit into domestic scenarios. These two works show Indian filmmakers readily borrowing from big-budget Hollywood models like the Terminator films and The Matrix (1999) and employing big flashy CGI effects (and in both cases, the services of Hollywood effects houses) to depict the superheroics. These borrowings peculiarly sit alongside standard Bollywood elements such as musical numbers and the insertion of often corny romance, as though the filmmakers are trying to reach as many demographic niches as possible. The opening fantasy sequence being had here by Armaan Verma shows just what a bizarre cross-cultural melange the film is – superheroics with Bullet Time slow-motion moves from Hollywood action cinema, martial arts vixens and a standard handsome long-haired matinee idol Indian warrior. In an interesting touch, the film and main villain is named after Ravana, the unkillable ten-headed Hindu demon god – although with equally bizarre cross-cultural miscegenation, the film also has the hero’s son’s avatar named Lucifer, none other than one of the names for The Devil in Christian mythology. The drawback of both Enthiran the Robot and Ra. One is that both of them are drawing on Hollywood models of science-fiction that are two decades out of date. Though Ra. One is set in revolution of cellular interconnectivity, it feels like no more than a copy of Virtual Reality/malevolent videogame film like The Lawnmower Man (1992) circa 1992-5. There was a spate of these videogame characters/villains come to life films made around this point with the likes of Ghost in the Machine (1993), Arcade (1994), Virtuosity (1995), Virtual Combat (1995) and Virtual Sexuality (1999). The scenes with the invincible shape-changing killer android pursuing people through traffic seems modelled on Terminator 2: Judgement Day (1991), as is the later plot element where the virtual character/android protects the child and mother, in so doing becoming a father substitute – here he even engages in a romance with the woman. The villain seems modelled on the MPC in Tron (1982), while the emotionless pursuing killer android in black leathers and shades is a directly copy of Agent Smith from The Matrix. By the same token, it is hard to believe that the videogame being demonstrated here would ever take off in reality – it seems to require that players conduct martial arts moves and acrobatics in mocap suits in the real world whereas most gamers I know are couch potatoes not exactly known for their physical fitness and willingness to leap about and get physical. The real world scenes are beset by the goofy comedy aspects customary to Bollywood – Shah Rukh Khan tossing his car keys to a valet but they falling down a woman’s cleavage instead; his accident prone attempts to park a car; mildly risque comedy centred around the translation of words like condom from Tamil to English; not to mention a bizarre scene where Shah Rukh Khan tries to do an imitation of Michael Jackson in Bad mode in order to impress son Armaan Verma. There are frequently times during these scenes that the film feels like middle-aged people without a clue trying to be hip to a youth generation – scenes with a band playing in the midst of a skateboard park; Shah Rukh Khan joining his son’s soccer team; and the aforementioned Bad imitation. During these scenes, Shah Rukh Khan plays the role of Shekhar as a spineless comic doormat. Much of Ra. One has been predicated around a series of action/superheroics set-pieces. There is a spectacular sequence with Tom Wu pursuing Shah Rukh Khan and Kareena Kapoor through London traffic on foot, taking gigantic leaps across the roofs of vehicles as they flee in a car, eventually crashing through a double-decker bus. We get other sequences with Shah Rukh Khan and Tom Wu engaged in combat, blowing cars out of the way with power blasts and then flying through the air while balanced on top of the flying cars. There is an excellent effects sequence where we see Ra. One being reconstituted out of tiny shattered cubes of material and a fabulous set-piece with Shah Rukh Khan running along the length of a train, jumping in and out of the carriages before the runaway train crashes through Chhatrapati Shivaji station and he brings it to a halt with his bare hands. On the other hand, these also sit alongside other action sequences that collapse into goofball slapstick – notably a scene dealing with hoodlums at Mumbai International Airport where Shah Rukh Khan proceeds to down them using a soccer ball and swinging Kareena Kapoor around in a series of improbable acrobatic moves. 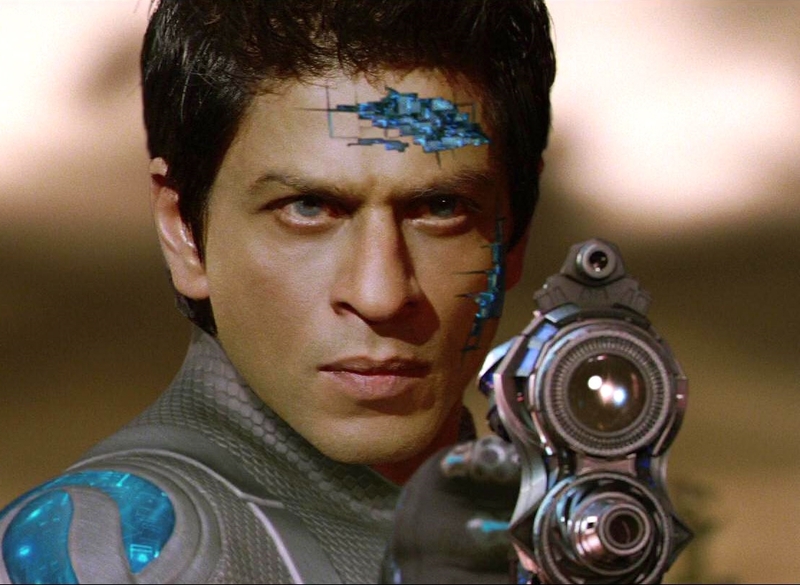 The problem so far with these Bollywood ventures into science-fiction is that they are only adapting Hollywood models for an Indian audience. While the results are in themselves not uninteresting in terms of sociological case study, one is still waiting for this Bollywood niche to produce something that stands out as a unique and original work of science-fiction on its own terms.